The Quinnipiac women’s soccer team continued its torrid start by outlasting Hartford in a 1-0 game to advance to 4-0-1 on the season. 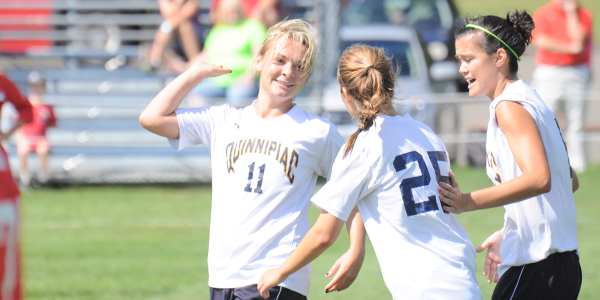 This is the best start for Quinnipiac women’s soccer since 1998 when they first entered Division I play. Quinnipiac (4-0-1) held a clear advantage in ball possession in the first half of play. The midfielders controlled the tempo with short, surgical passes, using the sidelines to carry the ball into opposing territory. In contrast Hartford (2-2-0) attempted longer aerial passes, and had less success applying pressure to the Quinnipiac defense. The lone goal came from freshman midfielder Shannon Larkin in just the 11th minute of play. 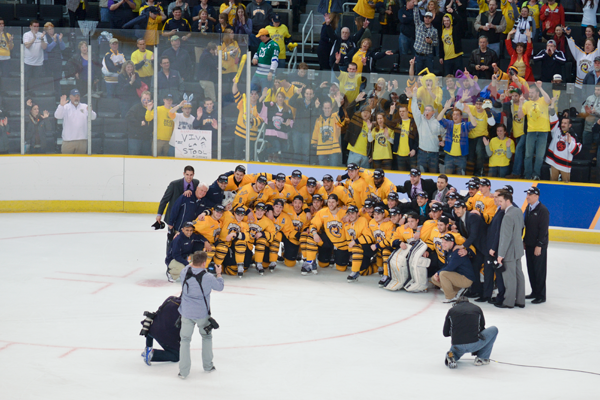 The goal was the result of a counter-attack by Quinnipiac. After racing down the field to halt a Hartford offensive, Quinnipiac passed the ball back up the field eventually finding the foot of Larkin. She didn’t hesitate before slipping the ball past the Hartford keeper Erin Quinlan and into the top right corner of the net. It was Larkin’s first collegiate goal. At the end of the first half Quinnipiac held a 3-2 advantage in shots. Clarke praised his younger players for their effort, but said that his team’s lack of experience was evident. He added that he expects the mental errors to decrease as the freshman and sophomores accrue more game minutes. There were three freshmen and one sophomore starting the game for the Bobcats. The substitutions Clarke made also reflect his faith in his younger players. Of the five substitutes, three were sophomores and one was a freshman. Quinnipiac goaltender Jill Kelley posted her third shutout of the season. Kelly has been named Northeast Conference Defensive Player of the Week for each of the past two weeks. Senior forward Kemesha Woodfine, the reigning Northeast Conference Co-Player of the Week was a dominant presence for Quinnipiac in the second half until leaving the game with an injury. She made an effort to return at the end of the second half, but was re-injured while taking the field. Her availability going forward was unknown to Clark. The Quinnipiac women’s next game comes against out-of-conference opponent Harvard on Sept. 12 at the QU Soccer Field at the Mount Carmel Campus.